I want to like sci-fi games more than I do. I really want to- I want to see the appeal and be able to picture the scale, grandeur and majesty of a campaign as I can with fantasy, modern horror, and supers. If we take supers as a sci-fi concept out of the equation, then I've only dip and dabbled in the genre. Exceptions would be the excellent freeform Star Trek game Jim ran for us and the brief Star Wars story arc I ran. Both of those, however, are licensed properties, which I think makes a difference. The near future semi-Transhumanist campaign I ran ended up being a Mage the Ascension game. I don't generally care for Cyberpunk- though as a genre it has some concepts and themes I enjoy. But I did played a few times, always for a handful of sessions before the games collapsed. I used to own various versions of Traveller, from the original box to 2300 to Megatraveller, but never ran or played in any of them. Spacemaster we tried for a single session, if memory serves me correctly. Art ran a short and very strange Lensmen-like GURPS Space game. I bought Trinity, Diaspora, and Serenity. I'd been looking forward to Bulldogs, but I've heard now that it is more Pulp Future than Firefly. The most interesting recent sci-fi game I looked at has been Greg Christopher's Cascade Failure. There is one sci-fi game that I keep trying to figure out how to retool. I bought the game when it first came out, and several years later played in several session of a campaign. Of course, that would be Fading Suns. While the campaign crashed and burned, the setting still intrigued me. I liked many of the details and ideas swirling around in it. But the game felt like a hodge-podge of ideas- some not taken to their logical conclusions, others played out too far. The system had some good points and some flaws, but that seemed beside the point. A good and compelling setting could be brought over to another game engine easily enough. I’d done that with L5R and Star Wars before. Fading Suns pitches itself as a sci-fi game with a fantasy rpg model. In some ways it resembles Dungeons & Dragons in space- with your typical mixed-up and diverse adventuring party. In other ways, it wants to have the grit of Warhammer Fantasy Roleplay. Some might even see it as a poor-man’s version of the WH40K. I don’t agree with that; Fading Suns has some of the same bells and whistles (the Church, decadent technology) it lacks most of the key ideas that really make up 40K. At least to my mind, the best example is D&D in space- with the problems which arise from that approach. It does suggest a vast wilderness, and the ability to explore, but that’s somewhat curtailed by the nature of the jump gates. It also means a party with very different agendas usually- in Fading Suns the various “races” have widely differing agendas. In addition, having a “Cleric” and a “Magic-User” in your party will probably lead to immediate strife. Fading Suns presents a rich back story full of conflict and detail, but that requires either ignoring or leaving as a looming threat for the game. The non-game comparison often made for Fading Suns is Dune. I think that’s a fair comparison. It wants to have a world with strange lost technology, obscure religious philosophies, guilds with power, psychic powers, swordplay and so on. However, Fading Suns remains too firmly tied to history. In Dune we have no real sense of how we got there- there’s no presentation of a Terran Homeworld. We’re so far out and away, those links have vanished. Society simply is. There might be some bits- like Lynch’s discarded historical prologue from the movie. But they’re unnecessary. Various races have evolved from humans- that much time has passed. In Fading Suns we have 3000 years. That might seem like a long time, but there’s a continuity to the history. There’s still the sense of mankind having expanded out. Add to that the presentation of the Church in the game. Fading Suns adapts a pseudo-Medieval culture and with it a pseudo-Catholic Church. It feels very Western and not very strange. In Dune all of the religious and philosophical material- crucial to Herbert’s story- feels alien. That’s not true here. Sci-fi with a fantasy element- swords and the pseudo medieval pageantry. Noble houses each with a different character. Psychic powers- with some interesting flavor to that. The idea of some of that power being corrupting. The ambiguity about the Church’s powers- should they really be seen as psychic. Decadent and strange relic technology. A sense that such technology is dangerous. At the same time, less sophisticated technology usable. Aliens present, but not central to the story. The possibility for social conflict, power struggles, and diplomatic and courtly activities. The Noble Houses as presented feel very monolithic. Even when you get some drill down in the secondary materials, those rarely do much to change or develop the initial stereotypes. The Church really feels awful in places- very nasty and dark. The various crusades there make certain other player character types a problem. Some of the aliens seem goofy- like the Vorox and some presented from the Player’s Companion. The diverse choices make for a diverse group, but an adventuring party approach eliminates some kinds of stories. And making a group from a single “faction” right now presents limitations. The nobility lack a kind of central ethos- a reason for being and a way of behaving that directs players. 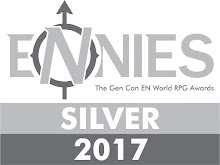 Pendragon and L5R offer those. Ship combat’s clunky and weird. Psychics get the short end of the stick. The awful presentation and layout in the second edition of the rules. All of that being said, I’m thinking about a new approach- a way of reworking the Fading Suns setting to bring in some of the elements I like from Legend of the Five Rings. I’m going to talk about that tomorrow and try to figure out if doing so is worth it. If the question is: why not just play L5R, I want to make sure I have a decent answer. I have a couple of ideas about structure which I’m going to look at in that next post. Fading Suns has always attracted me for its setting and repelled me for the same reason. I look forward to seeing more your thoughts on it. 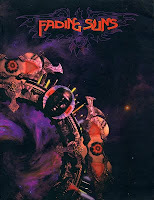 While I have always considered Fading Suns an interesting take on the type of Science Fantasy that might include Warhammer 40K and Dune, it's not really Science Fiction in a classic sense. Therefore, while cool, it wouldn't solve the conundrum for me that is suggested by your first paragraph. You "want to see the appeal and be able to picture the scale, grandeur and majesty of a campaign as I can with fantasy, modern horror, and supers." OK. My question is, are you seeing the appeal of Sci-Fi the way you can with fantasy if you need to add fantasy to it to do so? I am much more of a Sci-Fi fan than a Fantasy one so I often have the opposite question for myself. To me, Fantasy is only really cool if it's Fairy tale/Folkloric or if it makes sense. But if it makes too much sense, is it Fantasy or Science Fantasy or Sci-Fi? 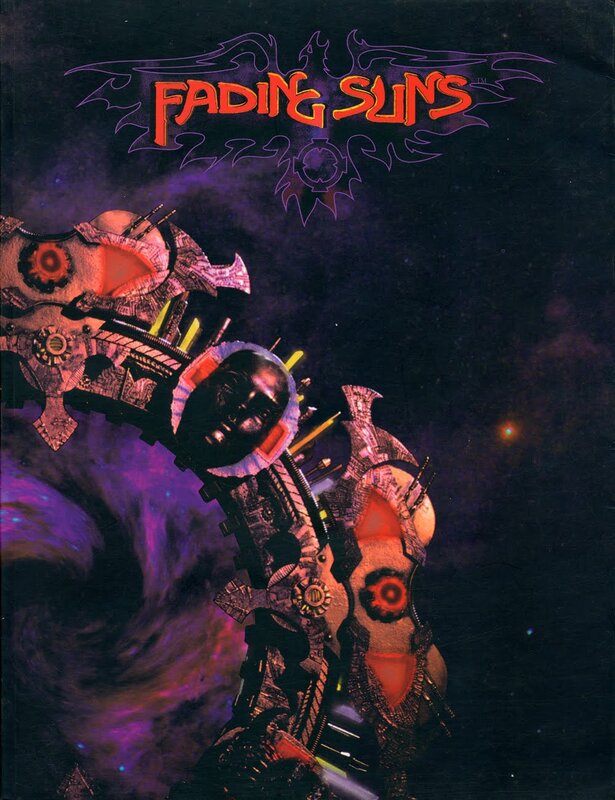 Fading Suns is one of those games I never picked up and read even though I always meant to. Even from the beginning where there was talk of Bill Bridges bringing some of the ideas from the dead WW game Exile. SciFi is a hard concept to capture it seems. Especially considering all the different directions that various authors have made popular. What one likes another will not. I have played in a campaign that lasted years. The setting was a melding of Traveller, Battletech, and several other games and sources that the GM kept all together in a big binder. Some of us loved it and got deeply involved while others just stood by a lot of the time. For me fantasy was the area I had the most trouble grasping. Horror and scifi were what I held onto the most. I think Fading Suns is supposed to be dark. 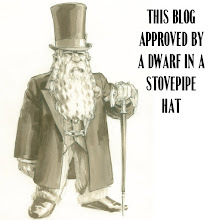 A Slaver's Guild would make a lot of sense - that doesn't mean the players must work for it. The monolithic nature of the houses might be explained by fanatical group psychology. However, even if this could be made convincing, it wouldn't necessarily be playable. @Barking Alien: I get your point about it not being "sci-fi" in the classic sense, but at least in the sense of my thinking about sci-fi it falls in there. I'd agree it isn't what you'd call hard sci-fi- and by many reckonings as you suggest Dune wouldn't be that either. I've been a hard sci-fi reader (Niven, Asimov, Clarke, Pournelle, portions of Cherryh, Brin, Stross) but that's certainly not where my interests have fallen. I mean broadly sci-fi hasn't really grabbed me for that, with the subset of hard sci-fi even more distant I expect. So I'm not sure I could find a solution within the realms of hard sci-fi, but at least on the broader definition I'm using I think I might be able to. But it does require there being some of the fantastic in the broader sense. You've got a good point. @Peter: Am I right in thinking what your objecting to is more of the straight fantasy or fantastical elements in things. And with that the lighter tone which often accompanies it? IIRC you liked SLA which always seemed to have an element of the fantastic to it. That seems a reasonable position- and certainly I've always seen that as Derek's approach as well (though I don't want to misstate his position). Fantasy can work as a background element, but perhaps only with a darker or horror tone to it? @postgygaxian: Absolutely. And it does become a little strange when the game essentially presents those slavers as one of the dozen and a half character path options given. It does seem like more of an NPC path. The monolithic nature could hold true- even in a place with such distances, but as you say, it doesn't necessarily make for a good set up or hook for the players. That's what I'd like- a more playable and interesting set up. @Lowell Francis If you look at the Muster as "Slavers" you're only looking at one facet of the Guild. They're also Bounty Hunters, Technologically driven Mercenaries, space-age Port Authority workers, and the Freemasons, and the temp agency of the Known Worlds (Although comparing temp agencies with slave traders isn't an unfair characterization). Additionally they're a huge administrative organization with it's own functionaries and internal security. There's a wealth of different stories you could tell just within that guild but you don't really need to treat the Slavers as NPCs. The ethical and economic challenges of dealing with the slave trade on worlds where it's semi-legal makes for an engrossing character-driven story. One of the earlier campaigns I ran was a Muster Slaver who was trying to get out from under the thumb of his superior.